core@team is proud to present the first part of "Spirit of 76" mod for rFactor. This first So76 part has two cars, a FIAT X1/9 Dallara and a Lotus Europa, you can race in a single-brand season for the FIAT and for the Lotus as well or you can race in a So76 season racing against these two cars. "The original models have been around for a long time for private use, since the F1C days. They have been improved a lot since. The car physics should be very realistic, they have been developed and tested over a long time and they are based on real data and experience. Put your Speed Sensitivity in the Controller menu to 0 (or very low) to have better control over slides. First make sure that your system and controller are set up fine before you drive. If you’re using the Realfeel FFB plugin, don’t forget to use a negative value. Check the graphical upgrades and the FFB Strength upgrades. For the Lotus you can also choose another more original version with a less modified 1600cc engine." "The Lotus Europa featured in this mod is a Group 4 racecar, based on the Lotus Europa Special. This means it’s a modified GT racer. It uses hard bias ply slicks which last long and will allow some sliding and drifting. But the key for being fast is smoothness. This car doesn’t have much power, so low weight and handling are it’s assets. The front spoiler and Chapman’s characteristic rear design of the car create a very small amount of downforce. " "The So76 Fiat model isn't just a X1/9 racecar, it's the Icsunonove Dallara version designed by Bertone. This modified Group 5 racecar is heavier than the Lotus but also more powerfull, and most importantly, it has more downforce. Keep a smooth line to make up in the corners what you might loose on the straights, and don't forget to keep the revs high. " Keep the oil temp around or below 100°C, do not go above 110°C. 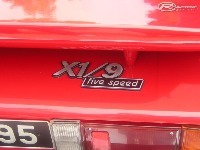 The more you rev the engine into the red the more you'll wear it, if you don't abuse it on the straights and lift when you shift it will last very long. The optimal temp is 90°C, the bias ply slicks can stand some abuse from sliding and drifting. Give them a bit of time to heat up. Below 100°C your brakes are cold, keep them between 200 and 360°C for optimal use, above that you're overheating with less brake power as a result. Special thanks to Loungekid for giving permission to use his Lotus Europa model as base. Run the 7Zip auto-exe file and find your rFactor directory, install there. We don't accept responsibilities for losses or damage resulting from the use of this mod, use it at your own risk. 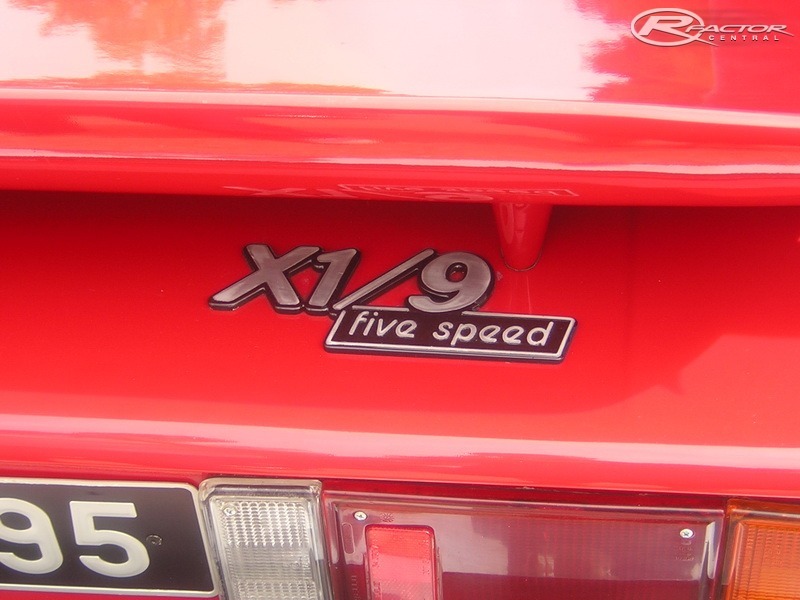 • Stefano and Simone Di Fulvio for their patience on providing reference pics, videos and sounds of their FIAT X1/9 Dallara, without their help the X1/9 model couldn't have been as it is. • Special thanks to all unnamed people involved on helping in this project. • Image Space Incorporated (ISI) for creating rFactor and their support to be a moddable platform. • Pete Walsh for his rFactorCentral site, a topnotch reference for the rFactor modding community. • RaceSimCentral forums for being one of the best resources gathering rFactor modding info. This Patch will fix the virtual mirror issue, adress the shadow bug of the cockpit windows and furthermore adds a "dirty window" feature by default. It is very important that you point the installer to your rFactor folder because a batch file will add the new parts to the according .mas files. We decided to add the dirty windscreen by default because of the compatibility to non patched version. Ifyou dislike the feature feel fre to contact us or replace the *wind01.dds - *wind03.dds with *wind00.dds inside the 2 mas files. Many thanks to Tarquin, TOG for testing. One of the best mods for rfactor for sure, to sound update for the lotus is one of rfactor best engine sounds. i´ve just d/l So76 and followed the .exe and it seems to be everything ok.. except in the game, in the showrrom, the mod doesn´t appear! I´ve tried with the .exe auto isntalation and manual also, the files seems to be all in the right places.. any answer to this problem? Well well. Ive waken up from other stuff Ive been working and should now continue a little bit of this modding stuff. Have to try to wake up the other guys also..
Dear Core team how are you. Any new about the update for this mod with BMW and Mercedes? Once again. I have tried this Mod forever. And??? Once again. It beats the latest console releases. For pure dedication and realism. \you cannot BEAT, rFactor MODS. (FACTPeriod). Those Techno boys? They don't know. What real World Racing is all about! It cannot simply be about Graphics and how we play? It is about realism. Within the context of the period. S0'76. Captures this period perfectly. Could do with an update though? I've tested this mod last WE and all i can say is it's excellent. The brakes also doesn't take much heat even on hard braking. Except of this 2 points all i have to say is thank you for giving us such a good mod. Great mod! The X1/9 is definitely one of my favourite cars in rFactor. The engine sound is fantastic! Hi! I can't find FIAT template! Core Team forum is not accepting subscriptions, somebody help me please! Awesome mod. The fiat car is just GREAT. thanks. this mod is fabulous, very good !